Grace and Hope is a mission that provides the spiritual and physical necessities for homeless men, women and children throughout the city of Baltimore. On the 3rd Monday of each month HSCC will visit Grace and Hope, provide a meal and lead a worship service for these amazing people. We are called to be the hands and feet of Christ in this world and to share the Good News of Christ to the ends of the earth. We’ve got to start somewhere. Why not here? We’ve got to start sometime. Why not now? I can guarantee you, you will be blessed, you will bless others and God will be glorified.There are several ways you can serve with us in this mission opportunity. Please see below for more details. We would love you to join us at the mission to pack meals for, worship with and minister to this great group of people. 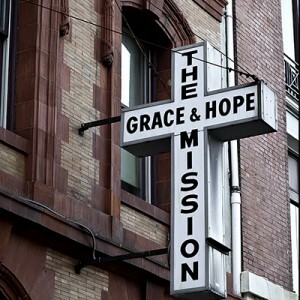 We will be meeting at a central location at 6:30pm on the third Monday of every month to caravan down to the mission. The worship service will start around 7pm and we will be packing up the meals for the men and women to take with them as they go. We will be needing several people to make a monthly commitment to make sandwiches and/or cookies, provide bottled water, packs of crackers and/or fruit. If you feel you can make a commitment to provide any of the following items, please let me know. The mission takes in 30-40 people per night, so we need to make sure we can provide enough meals. Below is an approximation of what we will need each month. If you can make a commitment to provide these on a monthly basis, it will ensure that we meet the needs of those we are serving.